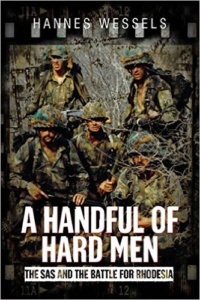 Re post – >Reader: Reviewing ‘A Handful of Hard Men’ – The day Zim’s spine snapped. Hannes Wessels’ third book documents the counter insurgency of the Rhodesian Special Air Service (SAS) between the unilateral declaration of independence (UDI) from Britain in 1965 to the transition to Zimbabwe in 1980. It is an anthem between soldiers once abandoned, now almost forgotten, from a country bent beyond recognition. Central to A Handful of Hard Men is the ruthlessly objective narrative of Captain Darrell Watt, revealed as one of many extraordinary fighters who survived the harrowing SAS selection process. At the height of its strength in June 1978, the Rhodesian SAS consisted of just 250 men but the damage inflicted upon the vastly superior numbers of Joshua Nkomo’s ZAPU and Robert Mugabe’s ZANU, supported by Samora Machel’s FRELIMO in Mozambique and to a lesser extent, the ANC in South Africa, is comparable perhaps only to the first weeks of the initial Boer War, when groups of farmers subjected the armies of the British Empire to successive, humiliating defeats. Wessels has produced an intimate study of rugged war that surpasses other publications of this era in its detail of the well-trodden path from Rhodesian schoolboy to soldier. Alongside Watt stood men of near identical aggression, loyalty and skill; Richard Stannard, who would later become involved in a failed coup d’état of the Seychelles; the American Bob McKenzie, a man determined to fill as many body bags as possible and the fearless Andy Chait, schooled in Johannesburg’s tough south, killed in action in March 1977. Of all the skirmishes Wessels’ recites between the belligerents, none express the SAS’ tactical superiority quite like ‘Operation Dingo’, which reads like Herman Labuschagne’s account of The Battle of Blood River, minus the spiritual paraphernalia. What became known as the Chimoio Raid occurred at the ZANLA training base in central Mozambique and witnessed the felling and wounding of thousands of operatives. The Rhodesian SAS and Rhodesian Light Infantry numbered no more than 200. From the smouldering ruins of the camp the SAS retrieved communist propaganda used to indoctrinate men and women who wouldn’t live to see its unconscionable practices or how it would be violated by nationalist elites across the African continent in the pursuit of wealth and status in the traditional central committee model. Incidents that portray ZANU and ZAPU cruelty toward civilians are particularly harrowing, but when directed toward their own recruits, they venture into the disturbing precedent set by early man. Racial solidarity reigned; independent thought or nonconformity of combatants was resolved by torture – those suspected of treason were brutally punished. It prompts sympathy for the idealists within the Nkomo and Mugabe camps, some of who genuinely believed in the prospect of a land liberated from white ‘settlers’. Testimonies of courage sometimes expose extreme political cowardice – the most recent example being Gen (Rtd) Stanley McChrystal’s unflattering comments about Washington liberals – which stripped him of his Afghanistan command. Robert Mugabe’s treachery is well documented, but what is less so is the role of the British government, something amply confirmed by the conduct of David (now Lord) Owen, former Foreign Secretary and his successor, The Lord (now Baron) Carrington. Wessels’ neatly observes the nothing both men knew of Africa. But whereas Owen could be partially excused in that he was a victim of his own fashionable but retarded delusions, Carrington is revealed as morally vacuous, scheming and duplicitous. I knew and admired the late Baroness Thatcher but her inability to untwist herself from Carrington’s forked tongue was a failure. Perhaps the greatest example of British hypocrisy toward the country lies in an event that occurred outside the book. In 1986 the British granted one Perence Shiri a place at The Royal College of Defense Studies in London. Nicknamed Black Jesus, this was a man who, under Mugabe’s instruction, personally orchestrated the slaughter of over 20,000 civilians in Matabeleland between 1983 and 1984. It was precisely this foul habit of running with hares whilst hunting with hounds that concluded in Mugabe’s disastrous land reform policies of the late nineties. Under Prime Minister Tony Blair and his Secretary of State for International Development Clare Short, Zimbabwe’s already brittle spine was decisively snapped. 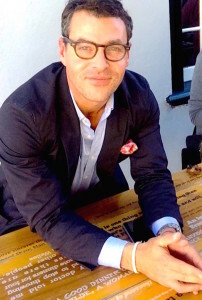 Within Wessels’ analysis lies evidence of the contempt toward white Rhodesians from quarters of the west which reveals itself as nothing more than a hacking of tall white poppies: Rhodesia’s ascent had been charted by the uncompromising spirit of black and white Africans who worked the land, shot accurately, drank happily, played rugby and enjoyed harmonious relationships with each other. Unwilling to pledge allegiance to anything but the soil, they were accused of illegal occupation – seized near and afar by opportunistic diktats and attacked in a manner eerily similar to enraged supporters of Cecil the Lion. Prime amongst these claims was that Africa belonged to Africans – that land was everything. White Rhodesians jeered. They knew too well that it was only something when you understood it. The rational expectation that current circumstances should vindicate white Rhodesians has been dashed as politicians and apologists scramble for excuses in the rush to explain why Zimbabwe can no longer feed itself, or is now considering issuing what are essentially IOUs as substitutes for currency. The spirit of the Rhodesian SAS has long been eviscerated from the country; today it exists only in faint traces in places like Simonstown and villages along South Africa’s Garden Route. In African countries where those illegally dispossessed of land started afresh. In Perth. In the words of those courageous enough to speak truth to authorities determined to misrepresent history. But history is unkind to those who insult it by attempting to defend indefensible errors of judgment. This is perhaps Wessels’ chief accomplishment; in describing a world seeking to abandon and isolate Ian Smith’s government, he leaves space between the lines for the reader to link a past to a political present – including evidence that suggests John Giles, an advisor to President Abel Muzorewa at the Lancaster House talks, was in fact murdered. Tony Blair has assumed the title of being the most unpopular Premier in modern British history. Jimmy Carter was once referred to as ‘the political equivalent of the house wine in a suburban Indian restaurant’. And in the twilight of his years, Baron Carrington is haunted by his complicity in bringing to Zimbabwe, and indeed the world, a rapacious, divisive, dictator who plunged an ambitious, educated black population into persecution, poverty and hunger. Simon Reader is based in London. Previous Post Lessons Based on Lies.